For the first time, the public will be able to explore beneath the sails of the world’s most famous house to find out how this pioneering green building is making itself more environmentally friendly, thanks to a new sustainability tour supported by Airbnb. 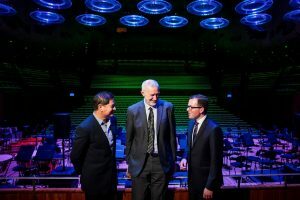 The new pilot program launched today will give people access to previously unseen areas of the Sydney Opera House, including its innovative seawater cooling system and waste recycling centre, and the award-winning, energy-efficient lighting system in the world-renowned Concert Hall. In addition to uncovering how Utzon’s masterpiece – globally recognised for its innovative sustainable design – continues to reduce its environmental impact, the one-hour Airbnb Sustainability Tour will inspire visitors to Sydney to follow suit with advice on how they can implement environmentally friendly practices on a smaller scale in their own homes. Sydney Opera House Director of Building, Greg McTaggart, said: “In the past 12 months we have made significant progress in sustainability, earning a coveted 4 Star Green Star – Performance rating from the Green Building Council of Australia and unveiling our latest Environmental Sustainability Plan, which includes ambitious targets that extend the savings, efficiencies and environmental legacy of the Opera House. Today’s launch is part of an ongoing partnership between the Opera House and Airbnb, which includes support for key ‘Greening the House’ initiatives. Airbnb Australia Country Manager, Sam McDonagh, said: “Airbnb enables people to share their homes, promoting a more efficient use of existing resources and is an environmentally sustainable way to travel. Home sharing results in significant reduction in energy and water use, greenhouse gas emissions, and waste generation, and also encourages environmental awareness among residents and visitors. The Airbnb Sustainability Tour will run at 8am on Tuesday mornings from 25 October to 29 Novemberfor a group of up to 15 guests and costs $50 per person. Included in the price is a specially designed Frank Green SmartCup and handy sustainable living guide. Book online at www.sydneyoperahouse.com/airbnbtour or contact Tours Reservations on +61 2 9250 7250 / tourismbookings@sydneyoperahouse.com.